Hello, friends welcome my blog. As you know my name is Bhanu Saini and usually, I provide you with some articles which are full of information. Today I am back with a new post in which we will discuss SEO, ON page SEO. as we all know that this is a very important topic for the bloggers because they want to rank their post in Google. Before going on ON page SEO let us discuss what is SEO? So the full form of SEO is Search engine optimization. This is a very important term for the bloggers as they have to rank their posts in Google. If you are expert in SEO then your post will become more friendly to the visitors or users and you can rank top in the Google. 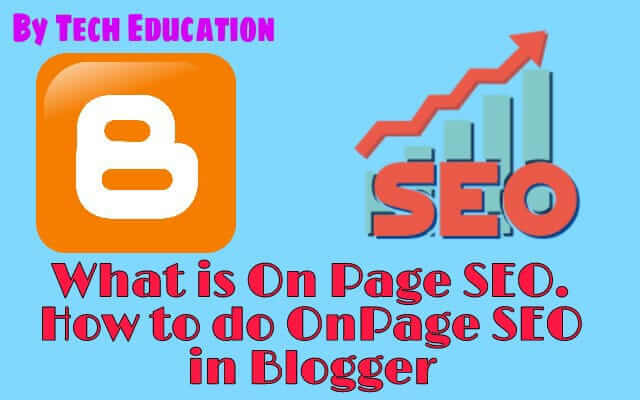 Search Engine Optimisation can make a blogger successful because it is an art by which we can attract users or visitors to our posts and get a lot of traffic. So as I told SEO is an art to attract the users to your blog. It is very important in Google AdSense approval because if your posts are SEO friendly then you will attract more users to our blog and if you are getting the organic traffic you will definitely get Google AdSense approval. So we can say that it helps in Google AdSense approval. Now let us discuss what we can do in ON page SEO to generate a lot of traffic. On page, SEO means the SEO which you will do on your posts or on your pages. This includes Keywords highlighting, Image renaming, Using proper Headings, Subheadings, Using original content, insert proper images, writing sufficient content and much more. So now we will discuss all these points and I will tell you the importance of these tricks by which you can easily rank in Google and generate a high amount of organic traffic. The keywords which have low competition are perfect for your posts because in low competition you can easily rank your post on Google on the first page. To find the perfect keywords you can use some extensions of Chrome i.e Keywords anywhere or you can use Google keyword planner to get the perfect keywords for your post. So you have to find the perfect keyword for your post. And you have to use that keyword at least 5 to 6 times and don't forget to highlight it. After uploading images click on the image. This will make your image SEO friendly and your image can also rank on Google. In order to increase your page speed please do not forget to compress your image before uploading. To compress your Image you can use TINYPNG tool which is available free online. This makes your post more SEO friendly and attracts users. In order to make your posts more SEO friendly, you have to use proper headings and subheadings. To insert any heading text we have to click on the top there you will see the heading option. By using headings and subheadings your post become more user-friendly and you can easily rank your posts in Google, so before writing a post don't forget to use headings, subheadings, and minor headings. Your post link must be SEO friendly and have your keyword in the link. But if there is no keyword in your post link then you can use permalink which is provided in blogger. This will make your post more SEO friendly and attract the users, so don't forget to use permalink include keywords in your link of the post. So these were some effective tricks by using then you can make your post more and more SEO friendly and attract more visitors and get a lot of organic traffic from Google. If you use these tricks then you will definitely get Google AdSense approval and your blogging will become successful. So friends if you like this post and these tricks then please follow me and share this tricks with your friends and again if you have any queries for suggestions and please use the comment box.